It is best if you bring your own boat for the camp. We will help you set it up for rowing with data and will also be able to give rigging advice. During the camp, your boat will be safely stored on the CVK Brno club grounds, out of sight and behind a closed gate. However, we understand that it is not always possible to bring your own boats. In that case, you can rent Wintech equipment. 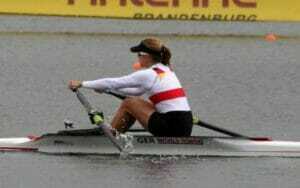 If you are not bringing your own equipment, we have the possibility to rent Wintech boats with Concept2 sculls. You can indicate the option when you book your camp. In reply to the confirmation email, please also indicate your weight and height, so we can make sure we bring the right boat for you. 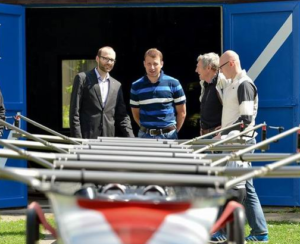 For the September camp, there is an option to prolong the rental period to include the World Rowing Masters Regatta. Boat transport to and from that regatta will be included. If your boat is not equipped with the Empower Oarlock or you don’t have a SpeedCoach GPS, we will equip you for the duration of the camp. The units may be purchased by you during the camp. We will be rowing with Quiske pods to measure oar depth, seat speed, boat acceleration and other parameters. We will provide the pods. You may purchase your own pod during the camp. The Quiske Pod works with the Quiske RowP app on iPhone or Android smartphone. Before the camp, please install the RowP app on your phone and bring a watertight pouch to put the phone in (or use a waterproof Android phone). No SIM card is needed for the phone, so you could buy a cheap, waterproof Android phone as your rowing display. Don’t hesitate to contact you in case you have any questions. We will use double sided tape to mount the phone to your boat, but if you have a phone mount, bring it with you.